Let’s face it, most of the time when you’re looking forward to something for an extended period of time, the actual event never quite transpires like the picture in your head. A trip doesn’t go quite as planned. Someone splits their head open on a fireplace at your birthday party. The large KFC meal you’ve been craving after a big night is cold and there’s not enough salt and there’s hair in it. All reasonably severe problems, I would say. 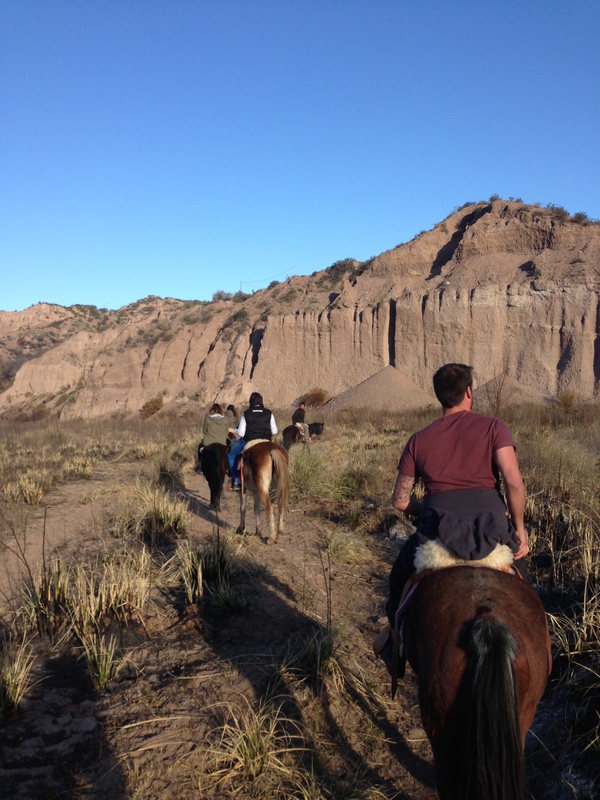 Don’t get us wrong – the rest of Argentina was great. But no matter how hard we tried, we couldn’t fall in love with the big cities like so many travellers touting the virtues of Buenos Aires before us. Every time we talked to another backpacker about the throbbing epicentre of South American nightlife that was Argentina’s capital, we thought we were missing a personal joke. The Argentinian wine capital was always going to be a particular highlight to our trip, and from the minute we arrived at our hostel it really was. Here’s why. That is all. Wine, just wine. 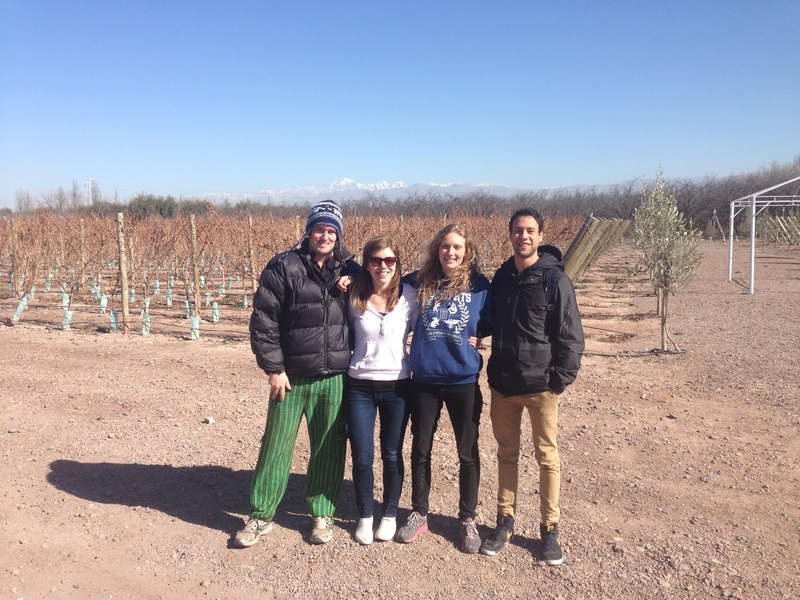 Mendoza is the wine-producing capital of Argentina, so naturally, that was enough reason for us to head there instantly. It’s also where I learnt the word ‘Malbec’ (NZ hasn’t exactly indoctrinated me in the ways of the wine) and have sought it out on every supermarket shelf ever since. The best way to tour the region (read: drink as much of the wine as you possibly can and cover the most ground you possibly can) is to hire a bike from Mr Hugo – he needs no introduction in the region, and there’s also no need for him to have a website. People just know. Here’s a step-by-step guide of organising a wine ‘tour’. Step 1: Get a gang together. Luckily, our little New Zealand twosome had instantly doubled overnight, and we’d recruited friend Phil who we’d met in Sao Paulo (plainly because he was also from New Zealand,) and some Aussie bloke whose rage we sparked when we accidentally turned on a light while he was sleeping at 10am in our hostel room. Unsolicited anger, we thought, perfect for a day of drinking. Four is probably a solid number – any more and you’ll need a roll call before departing each winery, the more pissed you get. 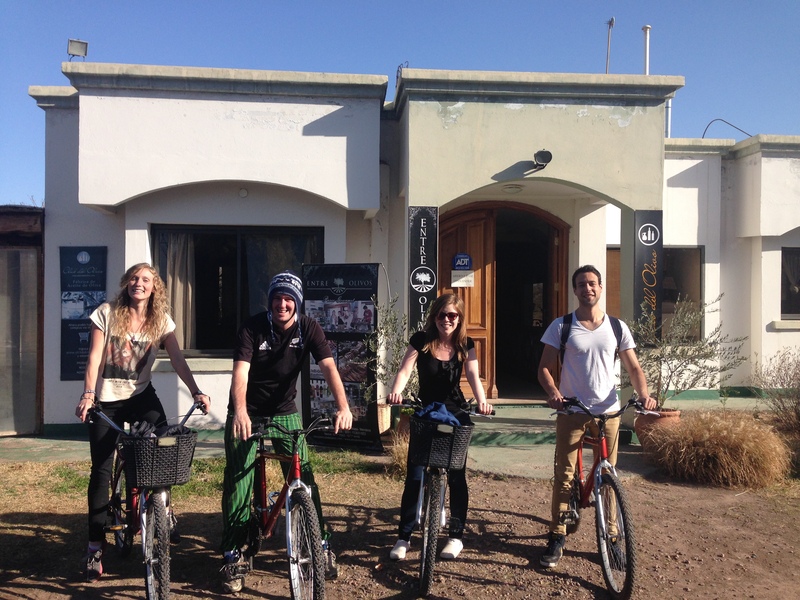 Step 2: Take a bus to Maipu (the wine region) mid-morning or so (it’s 5pm somewhere). Stop by Mr Hugo’s for a bike, simply because he’s such a dude; a friendly old man with a cute puppy, the cheapest hire price, a glass juice upon arrival at the end of your tour, sloshed and in desperate need of something with low alcohol levels, and a free bottle of homemade wine because he clearly can’t tell how pissed you already are. Step 3: Choose your route. No one wants to be biking all day (less drinking time), so we chose three vineyards (am yet to hear of anyone who’s made it to more than that) relatively close together and hit the road. Step 4: Drink wine. Most offer free tastings, some ask for a couple of bolivianos. Word to the wise; do a tour around a vineyard first while your brain’s still functioning and you can take it all in. It’s actually very interesting, and well worthwhile, even if you’ll remember none of it in several hours. Step 5: Bike a little pissed. Unless you’re a menace to cycling society like Phil, who almost crashed into an oncoming car on the other side of the road, on an empty highway, before we’d even made it to our first winery, without an ounce of alcohol in his body – it’s actually relatively easy. Ensure you have a basket big enough for all the wine you’ll be purchasing. Step 6: Finish the day with a visit to the chocolate and liqueur shop. Is there a better way to end a day of drinking and driving, than breads and dips and delicious chocolate liqueur? I think not. In short, you’ll never be able to drink a $10 bottle of Bernadino again. Not only because our monumental hangovers lasted several days, but also because we clear fell in love with the place, our three-day stay in Mendoza quickly turned into a week (a lot of which was spent lying in our bunk beds watching Mean Girls). However, when we did feel up to getting out and about again, we discovered there being a crap load more to the region than just wine. Whod’ve thought. An evening horseback ride usually takes you out across the arid plains for a couple of hours, and along a ridgeline to take in the sunset. After descending, the trip is usually complemented by a parilla (Argentine barbecue), which will have you munching down sausages and steak like it’s crack. The Argentine’s really know how to do their meats, and I’m fairly sure I consumed half a cow that day. Thankfully, I didn’t need another speck of protein for six months. An easy day trip from the city, accessible by public bus – this hike provides the best view over the plains of Mendoza in the vicinity. The climb is reasonably strenuous, though still completely doable for the unfit (us), and it levels off at 1870m high. 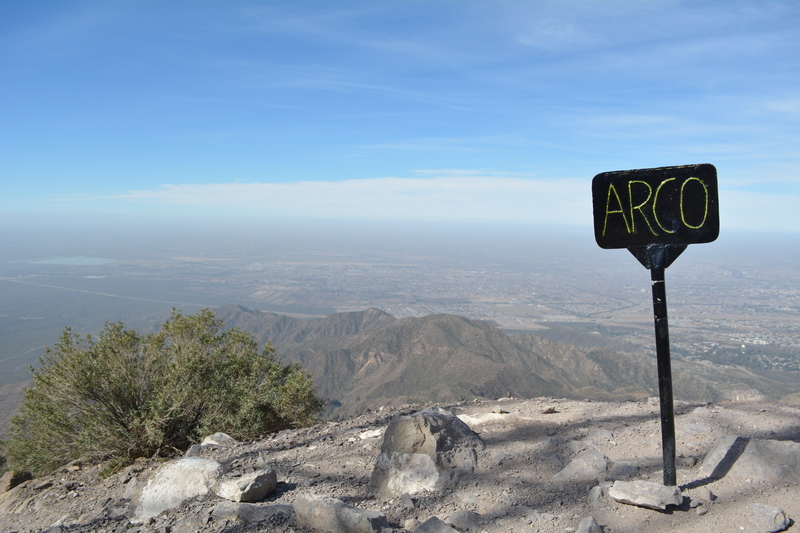 From the top, you’ll see out over the city, and then back over the Andes. A picnic and a glass of red at the peak effectively tops it off. Ask your hostel for directions, most of them will have a good idea of what bus you need to take. Please, if there’s one intrepid, long and largely uncomfortable trip you ever take: make it the jaunt over the Andes between Argentina and Chile. Our bus ticket cost $20, and while we knew we’d got a steal, we were still told to expect a luxurious bus with reclining seats and snacks – so imagine our surprise when we showed up and were shoved in the back of a mini van. Moreover, this was a mini van that tried to crash into an oncoming car before we’d even made it out of the bus station. We were also hungry before we even left the bus station, so things weren’t playing out well for us. Regardless, the Way of 365 Curves was everything we’d heard so much about. Snowcapped mountains jutting out of the cracked ground, a brief glimpse of Aconcagua – the Western Hemisphere’s highest mountain and one of the famed Seven Summits – sweeping views back over the plains, and a road that zig-zagged under one of the runs of at least one ski field. You’ll peak at a height of 3,000m, and each of the peaks around you will seem almost climbable. But we wouldn’t recommend it. Fork out for one of those fancy buses everyone tells you about when you announce you’re going to South America. The ‘cama’ class is proper plush, and if you’ve booked through a well-known bus company – you’re in for a right treat. For $80 NZD we got champagne on arrival, a roast meat dinner, movies on demand, wet towels, and a seat that fully reclined. Hey, we were only on board for seven hours, barely needed a bed and the money would’ve been spent on one of our longer jaunts – but we digress. This is the way to travel. The best hostel we’ve found in all our travels, on any continent. For the equivalent of $5 USD you’ll get a comfortable mattress, a gourmet breakfast, and ridiculously affable staff. But back to the breakfast (because it was took every ounce of our willpower to leave the buffet every morning). Think crepes filled with caramel, fresh pastries, omelettes upon request, and then all the usual South American fare. We got pretty good at Skyping our parents just as breakfast was starting with a wee pre-breakfast breakfast, then having breakfast when the other woke up, and then grabbing something on the way out. So yes, three breakfasts. Were we taking advantage? Most definitely, but when you’re paying less for a bed and a meal than a single omelette would cost you anywhere else, you take your chances. *There’s also free cake and free wine between specific hours of the day. Does it get any better?